Basically, a very smart person (I don’t know who you are!) figured out that push ups are not just great to use with ice cream—but with cake too! The good news is that you can order these push ups and make cake push ups for you and all of your friends! A quick Google search will give you numerous online suppliers of these cute containers–I’ve even seem them in local craft stores that carry cake supplies. 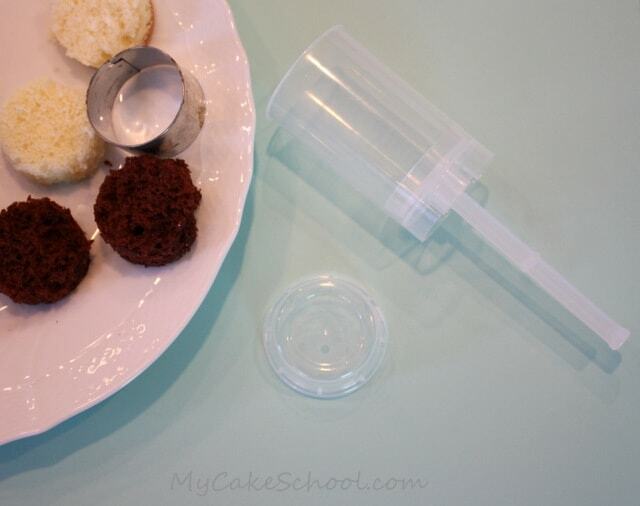 Simply use a circle cutter of a similar size to your container to cut out little cake rounds from a cake layer or two. 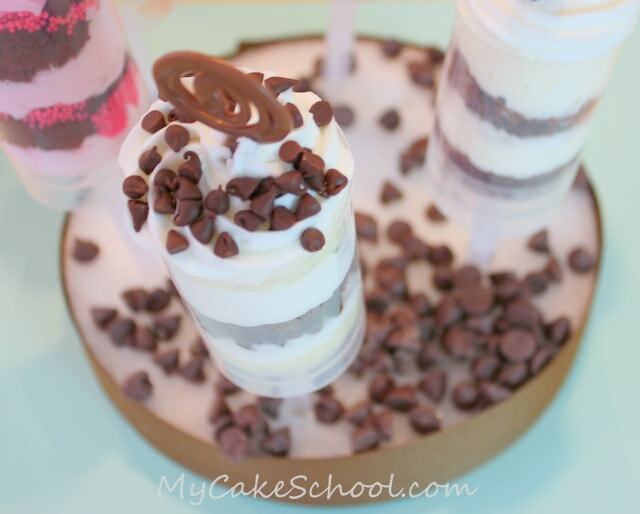 Experiment with your favorite flavor combinations…. I’m using strawberry & whipped cream here, but I also used vanilla buttercream, mint buttercream, chocolate chips, Andes mints, jimmies, sprinkles, & even a mock “mousse” made with vanilla pudding and whipping cream …. 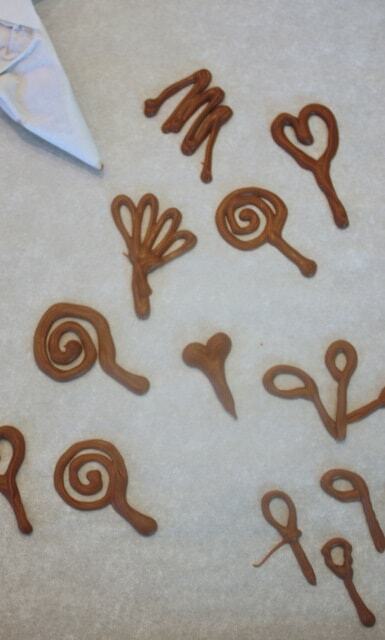 I made some cute little chocolate toppers that I piped with melted chocolate bark… but they would have been cute also with just a swirl of icing! Finding a way to display these is a little tricky. We used a circle of styrofoam which we wrapped with a brown ribbon (double sided tape) and covered with chocolate chips! **Make sure to stop by our Recipes section for our favorite cake and frosting recipes!! « Buttercream Dragon Cupcake Tutorial! I love these!!!! Growing up, those Flinstones Orange Cream push-ups were an obsession of mine. Oh the memories! thanks for the delicious ideas. did you have any trouble with the layers streaking the inside of the tube as you were stacking them? I just ordered 2 dozen of the containers from thebakerskitchen.net. I also saw a site (forgot the exact address) called something like pushupcontainters.com and they have the cheapest holder that I’ve seen so far. I’m holding off on ordering it until I’ve tried making these a few times. I make these all the time and the best price bar none is http://www.lagunawholesale.com check them out they have great items. I love these and I can’t wait to make them. I have one question, how do we eat them? 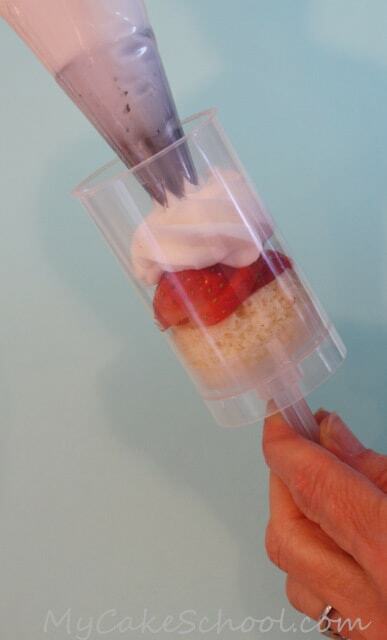 Do you use a spoon to eat the different layers or pushup and eat one layer at a time? Have any of you Canadian ladies been able to find these?? I am DYING to try them out! The only suppliers I can find are in the states and shipping is astronomical! I found them very difficult to fill. I would use a flower decorting nail to push first layer of cake down..make sure you container is all the way down…had more on my hands. Be sure you have thick styrofoam ready but found when inserting stick pushed up cake…have to find out how to not do this? 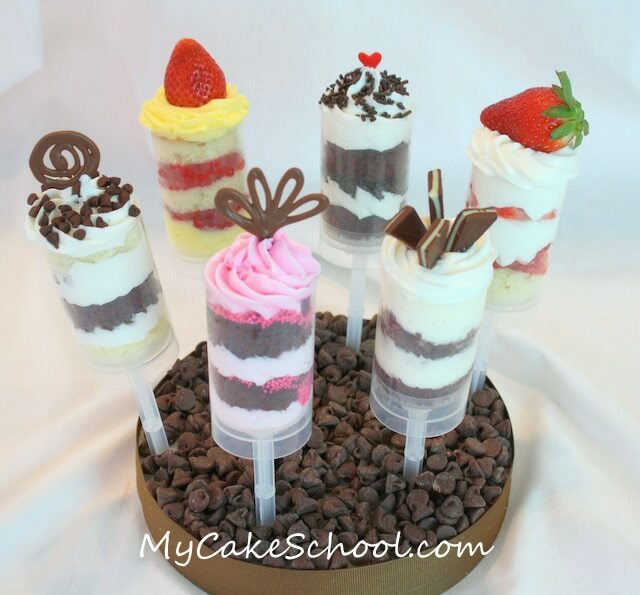 These look amazing!!.. I will be order these containers. So creative! These would be a hit at a wedding or children’s party! Thanks for sharing. They have lots of cute party supplies…. An easy way to cut to size is to use one of the push ups themselves. These are some of the cutest things I have seen all day! Do you sell this product? HI Priscilla, no, we don’t sell the clear push-up containers. There is a link in the post if you want to order on-line. Also, Wilton now sells them in craft stores. a beautiful thing … Does anyone know where I can buy push-up containers in Europa??!!! Thanks Grace, yes– I’ve seen them at our Michael’s too! This post is a few years old and they used to be so much harder to find. Thankfully you don’t have to buy them in bulk anymore like you used to. Thanks for the head’s up about Walmart!